I first set foot in the ‘hermit kingdom’ in 2005. I was visiting South Korea and travelled an hour north of Seoul to the Demilitarized Zone (DMZ); somewhat of a misnomer given it is one of the most heavily militarized areas in the world. The DMZ has separated North and South Korea since the uneasy truce resulting from the Armistice agreement signed in 1953. Inside one of three nondescript huts painted a cheerful sky blue and furnished only with a large conference table, I stepped over a grey painted line on the floor in the middle of the hut. 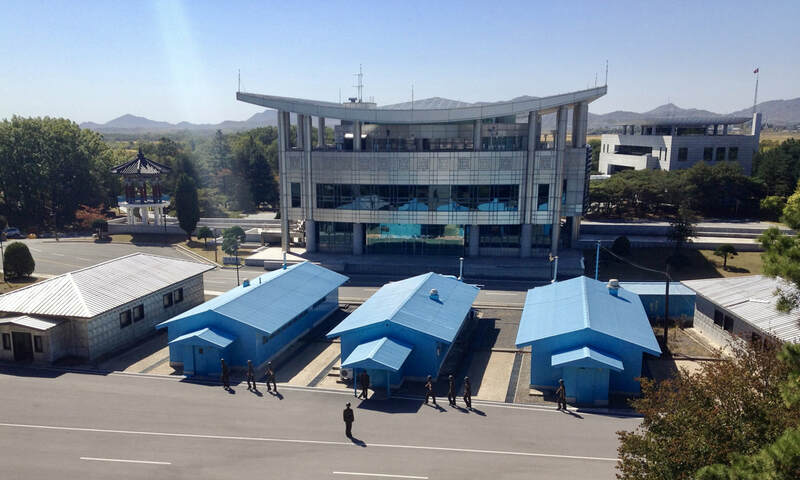 I stood awkwardly in North Korea under the surveillance of silent, heavily armed soldiers from both countries. The North Korean soldiers wore unsmiling faces, dark sunglasses, camouflage army fatigues. Squatting like weightlifters, they clutched machine guns to their chests. “One day I will come back here. But I want to approach from the North” I said to my partner. Fast-forward to October 2015. A decade after those first steps, I was heading off on a solo trip to the Democratic People’s Republic of Korea, the official name for North Korea. Although in reality no visit to North Korea is solo as all foreign visitors are supervised at all times by at least two guides. Approaching the DMZ this time from the North, we met our guide, a smiling and surprisingly affable soldier. “OK, bring your flags, we shall wave them at the South, it really makes them annoyed” he said, beaming at us. I couldn’t help recall the stern instructions I had received ten years earlier in South Korea, “for your own safety and to preserve peace, do not do anything that might antagonize the North. Do not under any circumstances photograph soldiers, do not use a flash and do not use binoculars. Follow our directions at all times.” I was relieved when our clearly disappointed soldier announced that we would abandon the flag waving, as there were no South Korean soldiers outside across the border. Travelling back to Pyongyang, painted billboards along the roadsides depict the demise of the ‘imperial aggressors’ (USA and Japan) at the hands of the North Korean army. “What does that poster say?” I asked another guide, Mr Lee. The poster featured a large fist smashing an American flag. “More pressure against USA oppression” he said proudly. Colourful painted murals on the streets depict Kim Il-sung and Kim Jongil, the revered Great Leader and Dear Leader of yesteryear in idyllic scenes: strolling through the snow, walking in the mountains and playing with happy children. Larger than life bronze statues of the pair dominate public areas. All adults proudly wear a lapel pin of one or both of the smiling Kims over their hearts and the two national flowers are named the Kimilsungia and Kimjongilia. The reverence in which Kim Il-sung and his son Kim Jong-Il are held is glaringly apparent. Their preserved, embalmed bodies lie in state permanently, exhibits in an impressive mausoleum. “Bow three times at each side of each leader” we were instructed during a somber briefing prior to viewing the leaders. This adulation of the leaders is not limited to the locals however. The International Friendship Exhibition is in a cavernous complex in stunning countryside at the base of Mount Myohang. The exhibition houses over 200,000 gifts presented to Kim Il-sung, Kim Jong-il and Kim Jong-un by the international community over the years. “The people of the world have given all these beautiful gifts to demonstrate their endless love and support for the Leaders” explained Miss Kim. “If you spent one minute looking at each gift, it would take over a year to view the entire exhibition” she added. A polished crocodile-skin suitcase from Fidel Castro; a black bulletproof limousine from Joseph Stalin; numerous bear skins from China and Russia; a basketball autographed by Michael Jordan presented by former US Secretary of State Madeleine Albright. Possibly everyone’s favourite for its sheer bizarre creativity, was a stuffed alligator standing three feet tall on its rear legs holding a lacquered drinks tray with a set of wooden glasses, presented by Nicaraguan rebels. Evidence, we were told, that even the animal kingdom worshipped and served the Dear Leaders. More mundane but no less bizarre gifts included novelty ashtrays, early 1990s era Apple Mac computers, a sushi press that imprinted an image of Kim Ilsung into sushi rice and a paperback guide to New Zealand’s flora and fauna from a guy called Andrew. “You can choose a gift to send from your country when you get home” said Miss Kim, which got me thinking. What do you give the man who has everything? A question no doubt troubling United States President Donald Trump as his meeting with Supreme Leader Kim Jong-un approaches.